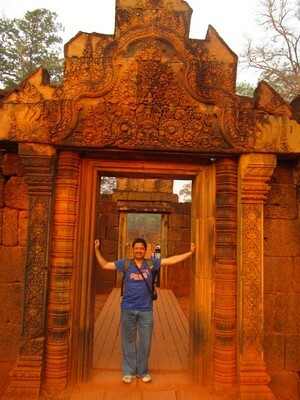 I visited Siem Reap during 2nd March to 7th March 2017 for TravBuddy meetup. Though the main temples like Angkor Wat, Ta Phrom, Bayon were on the main agenda, I got to know about this temple while browsing websites. It immediately caught my attention and I decided to visit here. When I shared my plan to visit this temple with TB friends, few showed their willingness to join me. So finally we were 5 people who decided to visit it early morning. Suyee, Amy, Merlina, Digvijay and myself set out for an exciting tuktuk journey to this temple early in the morning around 530AM. The journey through countryside in open tuktuk was very enjoyable. The temple lies around 40km from Siem Reap and it took almost an hour for us to reach there. When we reached there, we were surprised to see that there were no tourists at the temple at that time and so we explored the whole area leisurely. 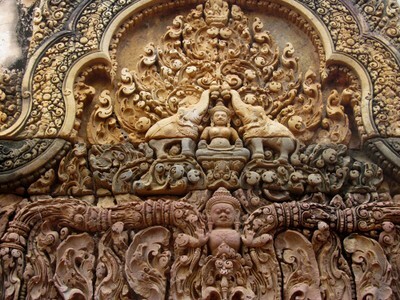 As the history goes, Banteay Srei was designed by Yajnavaraha, a court official of King Rajendravarman and dates back 950AD. So its nearly 200 years older than Angkor wat. This temple was constructed using red sandstone instead of the laterite stone which is commonly used at various Angkor temples. As we entered temple premises, we saw an information centre and all the historical information about temple was clearly displayed on boards. 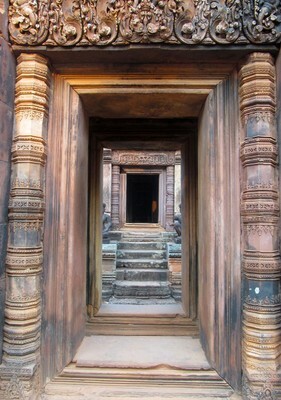 The walls of the temple have very intricate carvings. The colours and the intricacies are breathtaking. It is a NOT TO BE MISSED when in Siem Reap. 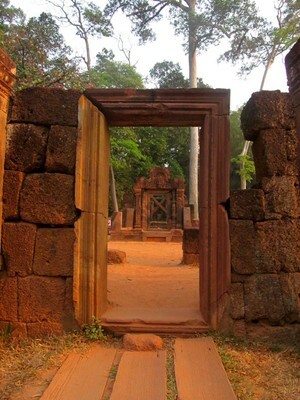 The size of Banteay Srei is very small and it can become overcrowded when several large tour parties arrive together. So I suggest you to visit their early in the morning to avoid crowds and also since there is no shade it can become quite hot in afternoons. It costed us about 40 USD per tuktuk (visiting this temple PLUS a whole day tour of other Angkor Temples) which accommodates about 3-4 people.